Friends of the Wild Whoopers (FOTWW) visited the U.S. Army Corps of Engineer’s (COE) Harlan County Lake recently to assess potential “stopover habitats” for Whooping Cranes. There is a growing need for more quality stopover areas during the Whoopers two 2,500 mile migrations each year. Typically, during migration, they stopover on lakes, natural wetlands and small ponds on private farms just to rest overnight. Like humans on a long trip they just need a small place to briefly stop, feed and then continue their journey. 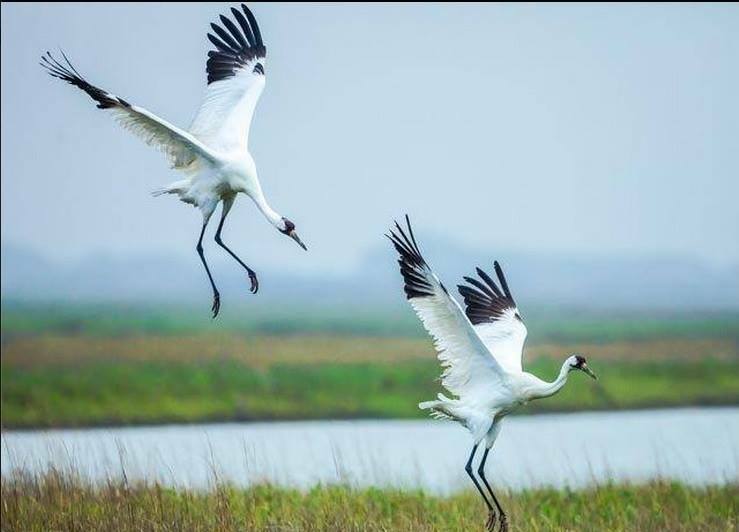 While checking out potential areas to protect and develop for Whooping Cranes, FOTWW also looks for opportunities to help other wild critters. Importantly, Whooping Cranes are compatible with other wildlife and briefly share their habitats. Ensuring that sufficient areas with the proper conditions as stopover sites are available for Whoopers is important for the survival of the species. Practical management techniques implemented by conservation interest can help reduce potential morality that occurs during migration. During FOTWW’s visit, Park Manager Tom Zikmund led us on a tour of the lake property so that we could to examine the most likely places that would provide Whooping Crane “stopover habitats”. Many potential areas were observed. Harlan County Lake is large and has a comprehensive program. At top of conservation pool, the lake covers 13,250 surface acres. At top of the flood control pool, the lake covers 23,100 surface acres. A total of 17,750 acres of land surrounds the lake’s nearly 75 miles of shoreline. There have been considerable fluctuations in lake water levels over the years. During drawdowns of lake waters large expanses of mud flats and shallow pools are created that favor many wading birds including Whooping Cranes. Importantly much of the lake bed has a gradual rise in elevation. When water levels in the lake rise some shallow areas become too deep for wading birds while new shallow areas are created near the shore. The U.S. Army Corps of Engineers environmental stewardship mission is to manage and conserve natural resources, consistent with ecosystem management principles, while providing public outdoor recreation to serve the needs of present and future generations. The Corps works in cooperation with several partners including the Nebraska Game and Parks Commission. Because of this cooperative relationship, the Corps has been able to enhance and revitalize thousands of acres of land surrounding the lake. Harlan County Lake’s 7,875 acres of grassland is primarily classified as mixed grass prairie. Native prairies are managed by prescribed fire and hay production. Such practices help prevent invasion by non-native species, enhance prairie community health and increase wildlife habitat values. These grasslands can also provide important foraging areas for Whooping Cranes. An important and effective habitat enhancement tools is the COE’s Agricultural Lease Program on 3,500 acres. This program makes many acres of public lands available for lease to farmers for the purpose of crop and hay production. Leased lands agreements include specific conditions to protect and conserve soil and water while enhancing vegetation and wildlife resources. Major crops include corn, milo and wheat that are rotated annually. Leases require that portions of the crops be left in the fields to provide abundant food and cover for wildlife. These crop lands are near the lake and can also provide very important foraging areas for Whooping Cranes. Although not a primary purpose for the construction of Harlan County Lake, recreation has increasingly become a major component in the Corp’s multiple use approach to managing our nation’s resources. Recreation and favorable fish and wildlife habitats are among those beneficial uses derived from this lake and others like it. With lake property open to all, there are many attractive areas for outdoor recreation including birding, water sports, hunting, fishing, and boating, or just relaxed living. Figure 1. Whooping Cranes stopping over for the night to rest and feed. Some of Harlan County Lake’s shore area is developed for recreational use and Whooping Crane “stopover habitat” is not compatible with some of these areas. Importantly, considerable areas of the lake’s nearly 75 miles of shoreline is shallow and is available as good “stopover roosting areas” for the cranes. Whoopers normally roost in areas with a water depth of 2 inches to 10 inches to help protect themselves from predators. Several Whooping Cranes have been recorded using stopover sites on Harlan County Lake property. Whoopers normally migrate over or near Harlan County Lake during April (northward migration) and fall during October – November (southward migration). Whoopers normally stopover to rest late in the afternoon and depart early the following morning. A big surprise to FOTWW is the use of Harlan County Lake by many species of birds. COE Park Manager Tom Zikmund told FOTWW: “It has been an amazing year for migratory waterfowl here at Harlan County Reservoir. Here are some of the highlights: An estimated one million snow geese stopped over on the lake from about February 26 – March 5. This is one of the largest numbers we have had over the years. In addition we had an estimated 50,000 Canada geese. Canada geese were here this winter from about December 20 thru February 1, 2018. Currently approximately 150 White Pelicans are on the lake. Also, there are currently about 15 different species of ducks on Harlan County Lake including mallards, greenwing teal, redheads, scaups, pintails, gadwalls, shovelers, merganzers, buffleheads, canvasbacks, and goldeneyes. We estimate that there are approximately 25,000 ducks on the reservoir. Likewise, some grebes and coots are showing up as well. We have observed several groups of sandhill cranes loafing on the exposed lake bed but to date no whooping cranes have been reported. Whooping cranes have stopped over on Harlan County Lake in the past but we have not spotted them recently. Some may have visited and were not observed. Figure 2. The site is typical of the bluff area around north side of Harlan County Lake. The photos illustrate features of an excellent “stopover area” for Whooping Cranes to rest and roost. The flight glide paths to the shore area for approaching cranes is clear of obstructions from several directions. The shore is wide and long making it an excellent site for Whooping Cranes to land. Extensive horizontal visibility from the shore and water roost site allows Whooping Cranes to detect any predators that may be in the area. The slope of the shore and lake edge is gradual and water depths of 2 to 10 inches are readily available for roosting sites. There is little or no emergent or submerged vegetation in lake at this roost area. This area is 200 or more yards from human development or disturbance such as power lines. Over 11,000 acres of foraging areas are located in grasslands and nearby agriculture fields with various grain crops. There are wild foods in adjacent managed grasslands that provide an abundance of insects, wild seeds and other wild food. Numerous other birds use these same habitats. Figure 3. This site is typical of over a dozen sites along the 75 mile long lake shore. It is located north and west of the dam near Highway 193. It has similar preferred habitat features as those in Figure 2. Pro-con: Should we change the Endangered Species Act?